This property was updated for the 2019 rental season with new painting throughout, new bedding, new carpeting, a new kitchen stove, and king mattress. Located on one of the most magnificent coastal roads in Maine, this terrific cedar shake cottage takes full advantage of the ocean views overlooking Islesboro Island. It offers more privacy than most Bayside cottages and is just over a mile from the center of the village. A large yard provides protection from the road and neighbors with private water access just a few steps away across Shore Road. The 1st level offers an open floor plan with galley kitchen, open dining area and living room with full views of the Bay - sliding glass doors lead to the very large wrap around deck for relaxing in the salt air. A full tub-shower bath and laundry area complete the 1st floor. The 2nd level offers three bedrooms and another bath that includes a toilet sink and soaking tub. A bedroom with a full bed and a very large bedroom with a king bed both have water views. The 3rd bedroom includes 2 twin beds and enjoys views of the natural beauty of the surrounding woods. A great space for a larger family or two couples to share, private water access for combing the shoreline or launching your kayaks, and tranquility for a most restful and enjoyable vacation. Air Conditioning: Yes, window AC units in the 3 bedrooms. Fans are in the rest of the house. This agency was great to work with and highly recommend them! I've never rented a house before and they made it so easy for me. They're very responsive, and always there to answer a questions. This is such an adorable house. It was so cozy and we felt right home from the start. The wrap around deck was everything! We loved having coffee outside with such a beautiful view. This was such a peaceful, relaxing vacation and we can't wait to go back! On the Water is a first rate operation - very customer oriented and responsive to any questions. A lovely,peaceful cottage with a gorgeous view of Penobscot Bay from the large deck. Very comfortable house with lots of amenities. I especially liked taking walks along the Shore Road which winds around the bay. Everyone from the agency was terrific. They were instantly responsive, always helpful, friendly and polite. We had a small issue with water pressure (which resolved by itself) but they were ready to swing into action even at 10pm on a Sunday night. Very much appreciated! Periwinkle Cottage was gorgeous. There are lots of different spaces to sit, so kids can play videogames on the TV and adults can read books without bothering each other. The deck has a lovely view and the smell of the ocean was intoxicating. On the Water in Maine Inc. was a very easy company to rent through. We loved the fact that we were hearing from them periodically before our stay to keep us informed. The staff was very friendly and helpful. Periwinkle was a wonderful cottage! The view of the water was where we parked ourselves every morning with a cup of coffee. The beds were comfortable and the cottage was so charming! The amenities were great! I loved having a dish washer and washer and dryer. The fact that we were able to bring our dog was the best! He had an amazing time as well! We could not have. Even more comfortable! Thank you! This is our 3rd year renting from this agency, and they are wonderfully organized and bend over backward to ensure the happiness of their guests. The Periwinkle Cottage is a well equipped, peaceful and enjoyable place to experience a relaxing vacation in the Penobscot Bay area. The shore road is a great place to walk, and you get to see both the moon and sun rise over the water if the time is right. We really enjoyed our stay! The porch was fantastic. We lived on it. The property on our week-long stay was just as advertised: well-maintained and clean in an attractive and convenient location. Making our reservation was very easy, and well guided, even when we had to change dates. The view and access to the shore. Nice view, nice beach, great place to walk. Very professional, thorough and helpful. This agency is totally committed to their guests, and makes sure that everything goes smoothly. When we had a question about the TV, Ben, the property manager, made a special trip out on a Sunday morning to explain it to us. They go above and beyond what most people expect from a vacation rental company. The Periwinkle cottage is a lovely place, with relaxing views of Penobscot Bay from the spacious deck. It is fully equipped and very comfortable, and we enjoyed our stay! Working with On the Water in Maine was a very pleasant experience. They were patient and helpful. This property had everything we needed. 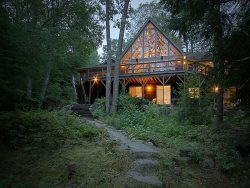 Great location - very peaceful, but turn right or left at the end of the driveway and you were brought right into a quaint Maine town. The view from the front deck was wonderful and the beds were very comfortable. Your agency is a 5 star business. You made it very easy for the whole process. Thank you. Everything was as stated. The view was fabulous and I can't say enough about the whole process. We were kept informed frequently. The whole experience was great! On the Water in Maine, Inc. was a great Agency, through the entire experience. Information received leading up to the rental was detailed and timely and they are very friendly and attentive. The location was great, though the beach across from the house is a bit rocky to enjoy with small children. But the convenient access to the beautiful beach in Lincolnville made up for it. Everyone I spoke with four corresponded with were extremely professional but very laid-back. It was almost as though we were renting from friends. The Periwinkle Cottage was perfect. Our 15 month old daughter loved throwing stones into the water and playing in the small side yard. House was well equipped with everything we didn't even know we needed- hand mixer to make fresh whipped cream, an assortment of books for rainy days, and extra pillows for added comfort. The private pebble beach was the icing on the cake! Working with On the Water in Maine was as easy as it could be, I spoke with a representative prior to booking to get an idea about the house and brining our dog, Munson, and she told us all about the area and how nice it was and she was right. It was an easy booking afterwards and the process went so smoothly had no issues and would definitely us On the Water in Maine to book again. Our family is already thinking of a trip back to Maine next year. Our family loved the Periwinkle Cottage in Bayside / Northport the house had everything we needed, the view was awesome, and the neighborhood was friendly and a great place to bring our family. Everyone enjoyed and one of our favorite vacations. On the Water in Maine is a great agency. You know the rental will be nice, well equipped and clean when you deal with On the Water in Maine! If anything is missing, they go out of their way to help. We will rent through this agency again and again. We were very pleased with the Periwinkle Cottage. It was clean and had a wonderful, open floor plan. We loved sitting on the new deck, looking at the ocean. The table and chairs were a comfortable place to dine. We did not spend time at the beachfront in front of the cottage - it was hard to walk here and not easy to get in the water. But we loved the small, Lincolnville Beach, just to the south - so spent a few days there. The walk along Shore Road is beautiful. The bedrooms are very comfortable and it was nice having two bathrooms. Working with on the water in maine was very easy. They made us feel welcome from when we first booked our vacation until our last day. They were there to answer any questions we needed an long the way. We really enjoyed the cottage. It was spacious and homey. Our favorite feature was the waterfront view. Members of the On the Water in Maine team were very accommodating and helpful in making arrangements. We felt this was a seamless vacation experience and all agreed that we wanted to (return to this property) and certainly go through On the Water Maine for our vacation needs. We wrote comments in the journal at the property. This vacation at your home was the first in many years for me, my husband and two adult daughters, one who came from Burlington, VT and the other from Richmond, VA. We quickly felt at home and settled in. We spent our mornings having breakfast on the deck enjoying the sun and view of the bay. My husband and I got up each morning and walked along shore drive. And we enjoyed many of our meals on the deck. We all agreed that next year we wanted to return to your home. Thank you.